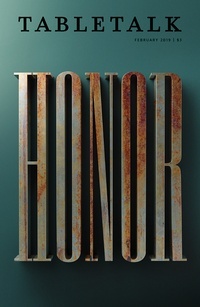 The February 2019 issue of Tabletalk will consider honor and the various ways this virtue applies to our churches, families, and communities. The last few decades have seen the concept of honor decline in Western culture, and this has affected our lives significantly. Our failure to honor one another destroys families and friendships, makes work environments hostile, and makes good relations with our neighbors impossible. Moreover, our failure as Christians to show proper honor is particularly egregious, for God commands us to honor one another in our relationships. This issue will consider the importance of honor, defining this virtue biblically and helping believers understand what it means to live honorable lives. Contributors include William Barcley, George Grant, Kevin D. Gardner, Matthias Lohmann, Matt Smethurst, Thomas Brewer, Harry L. Reeder III, Grant R. Castleberry, R. Albert Mohler Jr., Anthony J. Carter, David W. Hall, John MacArthur, J. Nicholas Reid, Bobby Jamieson, Joe Thorn, and Guy M. Richard.